In spite of scientific research and hard data to back the importance of goal setting, few business owners actually track goals. In fact, more than 80 percent of the 300 small business owners surveyed for the Staples National Small Business Survey said that they don't keep track of their business goals. Yikes! Based on that alarming stat, it's no surprise to realize that 77 percent of business owners have yet to achieve their vision. Truth be told, it's difficult to know if the "inability" to establish targets is a result of not learning how to do so (despite the plethora of information available online) or if it's something more ghoulish that gets in the way of setting, tracking, and achieving goals. Let's assume you were taught how to set goals. In fact, you probably set one or two targets in your lifetime. What kind of success did it create? Did you achieve your objective or, like many, did you miss the mark? If you strayed from your target, it doesn't exactly endear one to the notion of setting another destination, especially if it merely opens one up to crushing disappointment and accompanying litany of failure. Many small business owners are desperately afraid to set objectives--they just don't admit it. Think about it. Is there anything worse than living with the "imposter syndrome" that accompanies unrealized intentions? It's painful--mentally and emotionally. The stress that accompanies unachieved goals is staggering. Why would anyone want to go through the anguish of goal setting that leads no where? In fact, no one does...which is why few small business owners set targets--and even fewer business owners track goals if they do, in fact, set them. 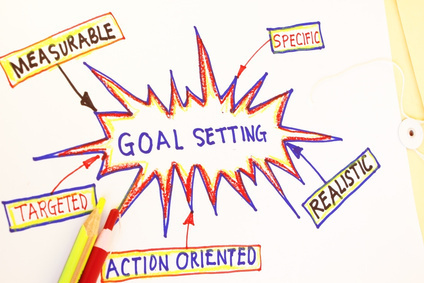 Goal setting is one of the most important skills to achieve optimal performance. In fact, those who invest in goals display greater persistence, creativity, and risk-taking in the achievement of their goals. Those in Group 1 were asked to think about what they wanted to accomplish for the next four weeks. Participants in Group 2 were instructed to write their desired accomplishment and rate them as above. Group 3 was asked to write their goal, rate them, and formulate actions to achieve their desired result. Group 4 was instructed to write their intended achievement, rate it, formulate actions, and send their targets and actions to a supportive friend. And, finally, participants in Group 5, wrote and rated their goals, formulated actions, and sent their plans to a supportive friend along with weekly progress reports. Public commitment to achieving targets is important. Accountability, including weekly progress report, is vital. Planning for goal achievement is necessary. Properly setting goals is still the best map for small business owners to achieve...and continue to realize the success they desire. Without this critical skill, most business owners continue to function as a wandering generality--rather than a champion--in their business. This article first appeared on Synnovatia's small business growth blog.